Basil ($2 per bag), Green Beans ($3.50/lb), Green Peppers ($4/lb), Colored Peppers – Red, Orange, Purple ($5/lb), Jalapenos ($2 per pint), Yellow Onions ($2.50/lb), Okra ($4/qt), Parsley ($1.50, sm bunch) Summer Squash ($3/lb), Watermelons – small, red flesh ($1/lb), “Multigrain” variety of our Hearth Baked Bread ($7), and Bouquets of Flowers (Mixed, or Sunflower – $5). Email us your order at BroadforkFarm@yahoo.com by noon on Wednesday and we’ll drop it off. Please leave payment (cash or check) in the envelope provided at the store. Yes, they are green. This is why we don’t have any to offer today! 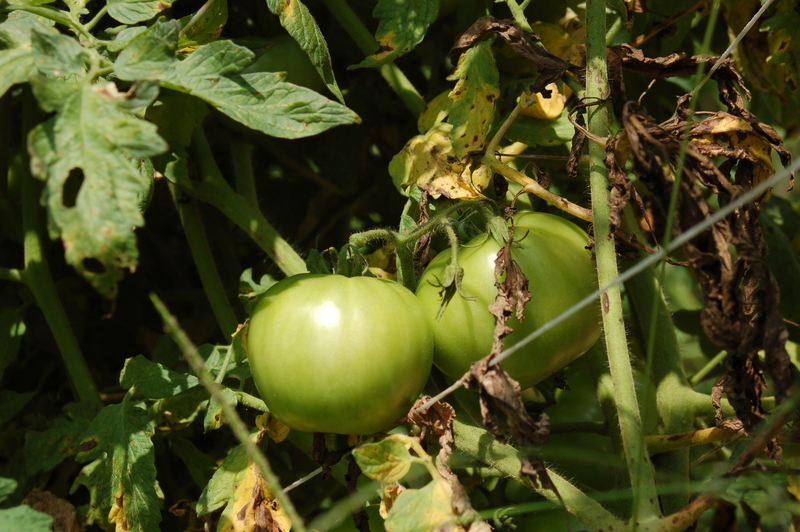 We plant 5 rounds of tomatoes during the season, hoping for no breaks in between rounds of ripe tomatoes. But…we have a little lull right now. A few were ripe enough for harvest today – just a few handfuls. We are crossing our fingers for markets this weekend. Until then, perhaps you will like this Ginger Garlic Green Beans recipe, or this Sauteed Summer Squash with Red Bell Pepper and Onion recipe. We have all four vegetables called for in those recipes, plus the parsley!